The KLICKfix system brings Reisenthel‘s handy and roomy shopping trolley to the world of bikes. On foot, the smooth rollers effortlessly carry your shopping. Once the shopping is done, the doubly adjustable telescopic handle elegantly disappears under a zipper. The adjustable Vario hooks make fastening the trolley to carriers with Ø 6-16mm a breeze, while the central latch provides additional security over rough terrain. 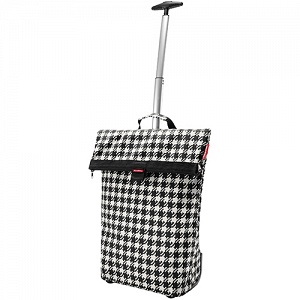 The trolley is made of tear resistant polyester and prepared for a left side usage on carriers.